I have not had things as easy as many may believe in my life. Learning about Swiss Army Knives is great meditation and teaches me every day. It is pure nirvana. Some times in my life I take notice of some certain emotions that life teaches that activators and knowledge that could be valuable for people to learn. Not everyone know that in the human mind we have abilities for survival and mechanisms that are there but people do not use them or train them. Just that you are aware of such mechanisms will activate this ability and you could be able to notice situations and times in the outdoors or in the everyday life situations or abilities to remember as useful items for survival. I do believe that good intentions and to be able to walk in freedom and safety is a human right. I will once again underline that I am not talking about fighting. I am talking about what to do for survival in areas with some population and around cities. I do not have to underline the dangers people are experiencing in these areas. People die from things that should be trivial to get away from alive. Ice, storms, car-crashes, terror and fire are just some of the dangers that kill people every year. When you have visions or emotions related to ordinary things in the everyday life you notice how senses sharpens, vision get better, hearing improves and the mind activates and you get a much quicker thought. In some cases the mind will go so fast that you look at things around you and it goes in slow motion. This is because you have activated the mechanism you have. Everything goes faster and during this the “when every second count” can be the difference between life and death. Adrenaline can be a very useful ability to control and know that when you need to activate the mind will respond. This is because you will in time be more and more comfortable but this time in a good way. You will be more comfortable because you are doing everything correct and you understand serious situations with control. A comfortable person that is not aware about dangers that can suddenly happen take far too long time to respond. This person may not have any cutting device with him either. When you set good intentions then this will help the body to realize and award with knowledge even about martial arts. It is not a negative thing at all because it is a human right to be able to defend from attack. Why talk about martial arts when I do not talk about fighting? It is the mechanisms you train that are just as helpful for ordinary survival situations. It goes hand in hand. I mentioned in one other article that comfort is one of the most dangerous factors. This is because people are used to everything going well every time. Soon or later it may be different and accidents happen. It is therefore my belief that with some training you will become a person that responds to the situation. Survival is not about making big efforts and exaggerated changes in the life. I do understand people that prep and so on too. I have been into all this before. In the outdoors on the water you automatically gather knowledge about what is dangerous and what is safe. It is unavoidable that you are on the limit a few times for the comfort. This is training that should be remembered. To prove that what I am talking about is correct then you take a normal situation with a group of people having a party in a cottage in the woods. There are also other cottages and cabins nearby. Suddenly someone hear a sound that is strange. Notice how some people are far more responsive of this. He or she takes action. That person knows about the little triangle with factors that are involved together… Good luck! People are forgetting basic abilities like how to swim for example. It does not cost very much to bring the triangle to the right on the picture. To get out of a sinking car or to free a person from rope or belts should be simple and easy to do. To drown because people are falling through the ice should not happen, it should be easy to survive. To know how to escape a tall building with a rope should also be simple to learn. Does it cost much to check the fire alarm in your house? One can separate a pure rescue blade and traditional SAKs. It is no point for further writing about this because if you study SAKhome.com then you will understand. 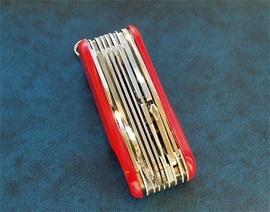 The epitome of Swiss Army Knives is helpful tools in the everyday, at work or in the outdoors. 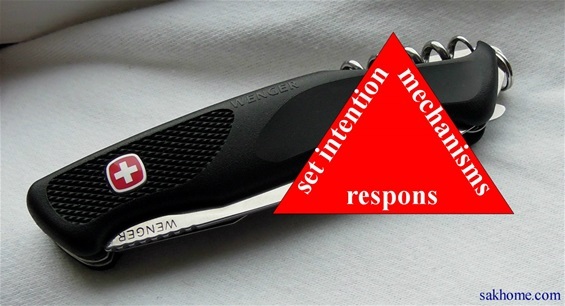 On the internet you can find stories with these knives and functions saving lives, time and preventing damage on equipment. There is no point doubting these knives at all because they been there and done that. When you learn to use SAKs, study and use them then you can also become an expert. For me it is not just the knife blade that is the key. It is every function and details on them that can be the difference between just knowing and specializing. Every function on them is very important because I know that both Companies in history made and incorporated details and functions for it to be able to become a more versatile instrument. This is a very important factor for why we get the evolution on the tools. Survival is just a little interesting new interest that I know the SAKs will fit perfectly into. There is comfort just to bring such tools with you. There will be much more comfort when you know what every function can be used for and how. A person that brings tools is aware that one never knows when you are going to need it. A person that Brings tools with good intentions and know what every function can be used for could become a resource. When people see a triangle some automatically understand that it is important. Some people may actually see a triangle and back away and say this is not for me. This is also a factor that people should understand in a good way. It cost so very little to become just a bit aware. People are forgetting basic abilities and this is also the case with tools. It is not necessary to go to advanced survival school to become a valuable resource. When people read and watch programs about survival in the wilderness then you automatically become aware about important things there. Survival in the wilderness and in areas I am talking about could be two completely different worlds. Most people will experience survival close to your home and in areas with other people. One must look at what causes people to die and then you will understand that maybe I should bring a Tollekniv, SAKs, Leatherman or other products when I am in the outdoors. One example on what causes tragic deaths every year is when people are walking on the ice. There are so many near accidents as well that this should be taken far more seriously. It is very strange in my opinion and it is evidence about what the comfort is with what people are used to. If you use the triangles on top then it would hardly be any problem. SAKs alone may not be sufficient to get out from the water if you fall through. All the other things combined may save you. A person that set intention and are aware will understand that if I fall through I will know how to get out. Maybe use your Swiss Army Knife at home and make ice picks or buy some to bring along. What about people that sees a person going through the ice. What do you do? It is many times not enough to call for rescue because time is important. Shock and hypothermia sets in very quickly. If you go out yourself on the ice then what could happen? That is why people should become aware what to bring along when you are in such environments. One thing you can do is to cut a long and large branch to distribute weight and get it out to the person in the water. People get weak very fast when cold. Ice can be difficult to predict and some places can be much stronger. 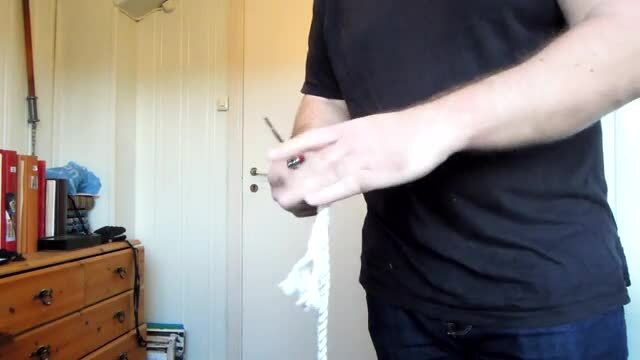 Rope can also be very useful. To try to get the person relaxed can be easier said than done. If you set good intentions then you will probably not walk on the ice when it is not safe. Comfort is a very dangerous factor if you are not experienced. It usually goes well but when it does not what then? If you set good intentions then you will probably walk around instead and therefore no accidents will happen. If you are prepared for walking on the ice then it could be different. Current and formations of the river can cause holes in the ice in rivers and lakes. Things going on at the bottom may also influence it. As an historian i know about the history of the world and important technological innovations. I am not only a theorist. That is what is important with SAKs too. I would also like to mention one more saying from the Håvamål and The Sayings of the Vikings. It is a small book with a collection of some sayings that are very old. I highly recommend this because for survival this is excellent in philosophy in some aspects. It is important to distinguish the good and bad aspects. Some of the Old Norse people was traders and people involved in good things as well. The traders had to go through dangerous areas and tough weather and return home again. and of the shining sun. who`s neither ill nor injured. On the video above this video you can see how the Wenger New Ranger creates a drag. There is not much difference between the OH plain edge 111mm vs. The Wenger 130mm. In this case it was the fireman plain blade. On this video is the fireman beltcutter without Lock or OH. It is very good! The OH Victorinox Lock rescue blades are much better than this..Extreme! It is a bit so with the larger SAKs that it can take some pull-force. 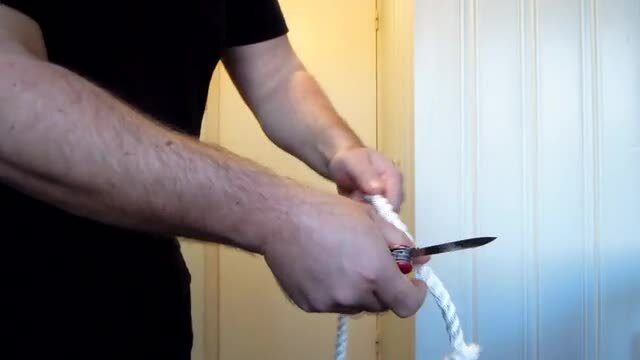 If you have time you can use a lighter pressure and back and forth motion......Rope are no Challenge for Victorinox or Wenger knives. They will bust the rope to yin yang. I have tested them on belts and it is the same there. I hope you can get use for some of the things written in this article and page. Once again i would like to mention the Wenger New Ranger knives. These knives represent one of the most serious outdoors products ever made in Switzerland.